Media captionJason Coffman: The last thing I said was 'Son, I love you." Police say he used a legally owned .45 calibre Glock semi-automatic handgun, which had an extended magazine that is illegal in the state of California. Police say they do not yet know how many shots were fired, or whether the gunman reloaded during the attack. At least 10 people are known to have been wounded and others are self-reporting with injuries at local hospitals. One survivor said he and his friends also escaped death last year in the deadliest US mass shooting of modern times, when a gunman killed 58 people at a Las Vegas country music concert. Nicholas Champion told CBS News: "We're all a big family and unfortunately this family got hit twice." Popular among students, the bar is close to California Lutheran University, Pepperdine University and Moorpark College. For the United States, this is the nightmare that never ends. The names of countless schools, churches, colleges and even entire cities have become synonymous with mass murder. To the list of Las Vegas, Orlando, Virginia Tech, Sandy Hook, Sutherland Springs and Parkland we now add Thousand Oaks. 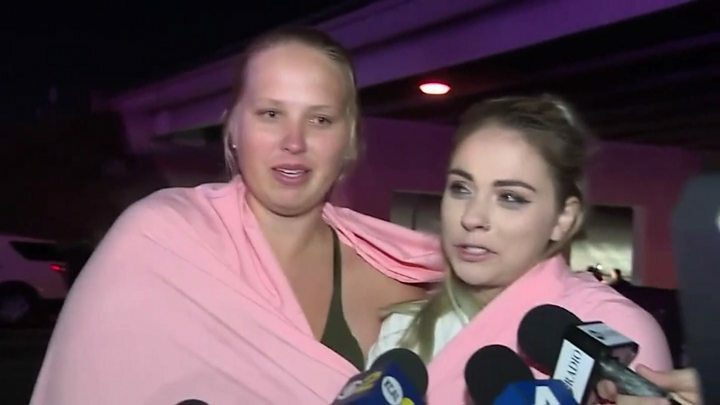 At the Borderline Bar and Grill survivors huddled together in the darkness, shivering in the clothes they had been wearing in the warm, friendly bar. Many of the patrons were regulars who had come to enjoy country music and dance together. The mood among the little groups of friends was one of shock and despair - but what was absent was a sense of surprise. Ventura County Sheriff Geoff Dean described the scene inside the bar as "horrific" and said there was "blood everywhere". Ventura Sheriff's Sergeant Ron Helus, who later died in hospital, tried to enter the active scene with a local highway patrolman when he was shot several times. "It saddens us all and tears at our emotions," the sheriff said. "He died a hero. He went in to save lives, to save other people." 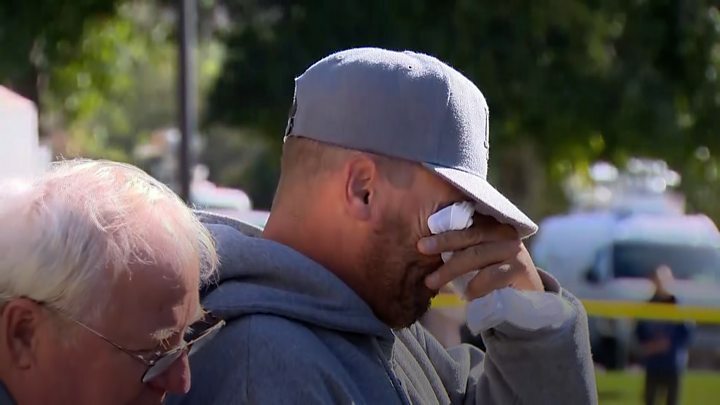 Sheriff Dean, who on Thursday completes his last day serving as Ventura County sheriff, warned: "It doesn't matter how safe your community is, it doesn't matter how low your crime rate is - there are people who just don't think properly everywhere, I don't care where you are, and they commit horrific acts like this. "There's no way to process. There's no way to make sense out of the senseless." President Donald Trump issued a proclamation ordering flags to be lowered halfway at the White House and all public and military buildings to commemorate victims of the "terrible" attack. During talks with police, he appeared "somewhat irate, acting a little irrationally", the sheriff said. A police crisis intervention team interviewed him, and determined that it was not necessary to hold him against his will in a mental health facility. People may start drinking too much alcohol or using drugs (including painkillers). Mental health professionals believed he suffered from PTSD (post-traumatic stress disorder), the sheriff said. In a statement, the US Marine Corp confirmed that he had served from 2008-13 as a machine gunner and rose to the rank of corporal. He served in Afghanistan from November 2010 to June 2011 and received the Marine Corps Good Conduct Medal, the Afghanistan Campaign Medal, and the Global War on Terrorism Service Medal.